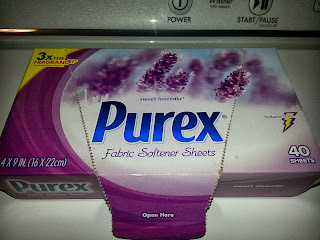 I was recently sent a box of Purex Fabric Softener Dryer Sheets in sweet lavender. Lavender is one of my favorite scents. It is so relaxing and smells so good. More importantly (for me), it is one of the few scents that my Husband approves of. That Man is picky and I aim to please. I do admit that in the last decade I have been lax in using dryer sheets due to our crappy laundry situation. We lived in an apartment building where we had to carry our laundry (and the accompanying detergent, softener, dryer sheets, bleach, etc) to another building to do our laundry in machines that didn't really work. As a result, we normally skipped the bleach and dryer sheets and often fabric softener. Thankfully I now do laundry in my house using high efficiency machines that actually work. As a result, I have come to appreciate the importance of dryer sheets. My first few loads of laundry in my new home were so full of static. Then these babies arrived and my laundry habits are now forever changed. These dryer sheets not only reduce static cling, but they eliminated all the static! ALL of it. I do wish that the scent lingered on the clothes more than it does. I can hardly smell the lavender after a load comes out of the dryer. My clothes seem softer after several uses with these fabric softener sheets. They also repel pet hair and repel lint. I have also been using these fabric softener sheets for other purposes. They currently have my garbage cans smelling wonderful. You can also use them to dust your television and computer screens. I have also heard that you can use them to (not yet tested) clean blinds, remove soap scum in the bathroom and polish mirrors. 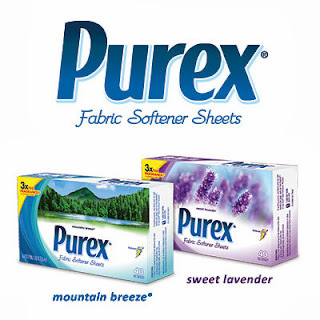 One thing is for certain; you need these Purex Fabric Softener Dryer Sheets in your life. Guess what? You can win some right now! Disclaimer: As a member of the Purex Insiders I received a free box of fabric softener dryer sheets as well as coupons to giveaway to my readers. I was not compensated in any other way. All opinions are 100% my own. Yes I use them on my hair in winter, no static. I have used dryer sheets to make angel christmas ornaments. They work great to shine your shoes. Mountain breeze is my favorite. I put dryer sheets under the driver's seat in my car. It makes my car smell really good. I Like the sweet lavender scent. Have you ever used dryer sheets creatively? What have you used them for? I put them in my shoes. I would like the Mountain Breeze scent. I would love to try sweet lavender . i put dryer sheets in my dresser drawers. I would like mountain breeze. I would prefer that sweet lavender. I throw dryer sheets in the bottom of the garbage can. I like the sweet lavender scent. Thanks so much for the fantastic giveaway! I have used dryer sheets creatively-- put them in my suitcase when traveling to keep my clothes smelling nice and also in my dresser drawers sometimes! The Mountain Breeze scent sounds lovely! I'd like to try that. LOL, the comment above me is hilarious. I've never used them for anything other than putting them in the dryer, didn't know they had other uses. I'd like to try the mountain breeze. Yes, I have used dryer sheets as a safe bug deterent. I would prefer sweet lavender. I have never used them any other way. I do not use them in any creative way but my dad wipes down his cats with them to make them smell better.. I do not think its safe so I do not do that to my cats. I use the dryer sheets that have been used to dust off the lint from the dryer that builds up. Just dust and toss. Mountain Breeze is the scent I would choose. I have put a dryer sheet in with my blankets when storing them in Space Bags. My favorite scent is Mountain Breeze. I put dryer sheet in my sons gym bag. I want to try the Mountain Breeze scent most. I use dryer sheets in dresser drawers. I love the fresh lavender. I have used dryer sheets in my trash can. I like the Mountain breeze scent. I use used dryer sheets for dusting!! I like The Mountain Breeze Scent! I would choose the Mountain Breeze scent! I leave them in draws to keep them smelling fresh! I pin dryer sheets to my air conditioning filter so the scent fills the house. It's a quick way to get to each room quickly. I'd have to go with the Mountain Breeze for most laundered items. It seems like a good refreshing scent that would help keep me going all day. Lavender relaxes me too much. It would be good for my night clothes & towels since I bathe at night. I never throw them out after the dryer - I put them in dresser drawers and between pillow and pillowcases! I use them to remove cooked on food from pots and pans. I would love the Mountain Breeze scent. I stick them in my dresser drawers for added smell. I want the lavender one. I haven't used dryer sheets creatively. I've used them to line my dresser drawers for years! Thanks for the chance to win. I use them in several ways. A used dryer sheet is great as a cleaning cloth for windows, mirrors or more. Also, I rub them over my screens and I put them between my window and screens to keep gnats and flies from coming in...it works!! And when the breeze comes in the smell is nice as well. Used creatively---just have them stored in the closet.